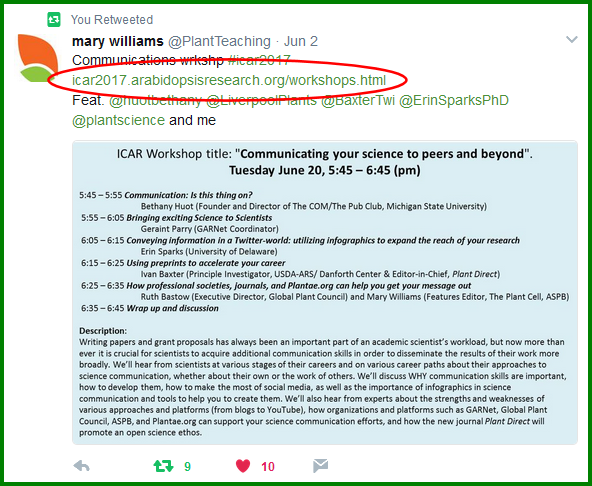 Reminder: This post series is an expansion of the post I wrote for ASPB’s Plant Science today blog in preparation for the Plant Biology 2016 meeting (Click Here to read). It supplies the ground work for approaching the conference season. When diving into the Social Media pool, it is important to remember that whatever you put out there lives forever. We’ve all seen movies where information essential to the plot was lost when a hard drive was deleted. But wait, the information wasn’t gone! It could be recovered because “Delete” does not erase the information it just breaks the link. We should look at social media the same way. Once information is put out into the digital world, as in the form of a Tweet, it can be deleted but cannot be erased from history. Information posted to social media is on the host servers, and is their property. While some say they will protect the information, this is a policy decision not a legal one, and, therefore, can be changed at any time with a simple notification to you. But even if the host company always protects the information you post, this should be of little comfort that a “Delete” will protect you. Once posted, information can be captured in any number of ways and remain available in perpetuity. Future employers, colleagues, or your mother-in-law could seek it out at any time. None of this should scare you away from the benefits social media has to offer you or your science, but should convince you to be responsible with what you say about yourself and others. Twitter and other social media platforms offer a “great power” to communicate our science to each other and to the world we hope to impact, and, if we embrace this power with “great responsibility,” this impact will be a positive one with a global reach previous generations of scientists could only dream about. I was first introduced to Twitter as a travel awardee of the 2014 IS-MPMI Congress in Rhodes, Greece. All travel awardees were asked to get Twitter and Facebook accounts prior to the meeting. Once there, we were put in small groups, assigned sessions and asked to live-Tweet and write up Facebook posts for those sessions. To get us started, Sophien Kamoun gave us a “How to Tweet” lesson, and we were sent off to help disseminate the meeting highlights via social media. To be honest, I was a bit intimidated at first. Talk about imposter syndrome! You want me to risk looking like an idiot in front of the whole world when I unknowingly misrepresent someone’s work? To avoid this catastrophe, my tactic was to run each Tweet by a group member prior to sharing. I’m still hoping this worked! 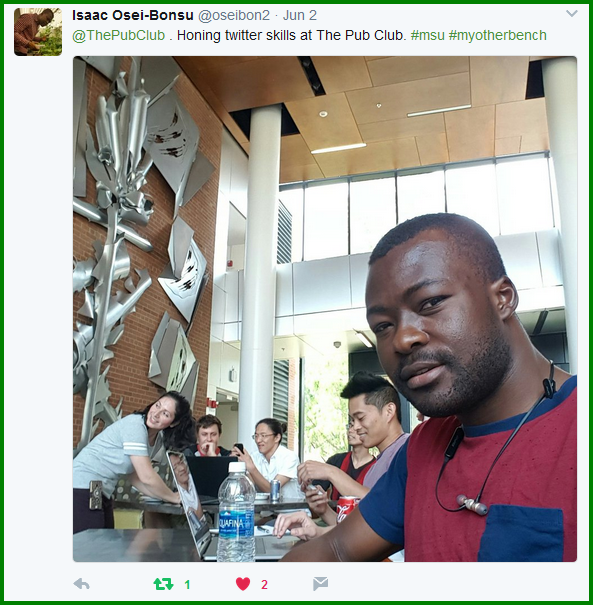 I’m thinking it did, as Sophien “Scooped” my “Storify” of Sharon Long’s talk at the 2016 IS-MPMI Congress in Portland, Oregon (click here to read). While I did not keep my Facebook account following the meeting, I slowly became aware of the advantages of Twitter for keeping up with the overwhelming, breakneck pace of the scientific world. I found interesting people and organizations to follow, and, over time, became more comfortable with sharing my own tidbits. While my Twitter output fluctuates, I regularly use my Twitter feed to keep up with new work published in my field as well as have some clue regarding breakthroughs in science outside my field. One exception to my infrequent Tweeting is when I go to scientific meetings. 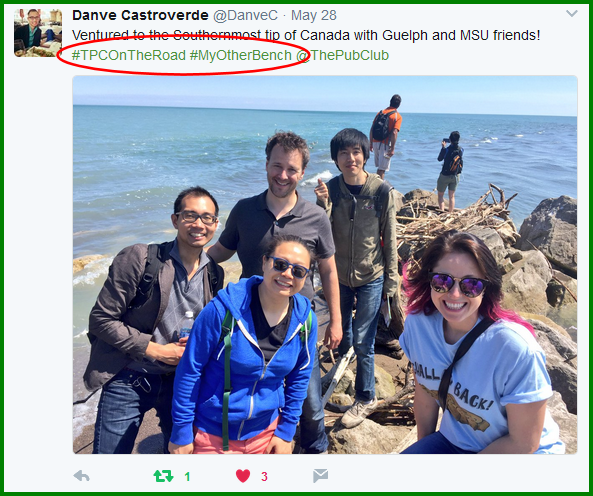 In fact, I was one of the top Tweeters at the 2016 Plant Biology and IS-MPMI Congress meetings! Why do I Conference Tweet? Not only do I develop my communication skills, I find it is an excellent way to stay focused (especially towards the end of a week-long conference). Also, the public nature and limited character length help you develop the ability to quickly and concisely pull out and share the Big Idea of each talk. In addition, I like to pass on helpful resources or new publications shared by presenters. Finally, it is also a great way to meet people (See Conference Prep Series: Networking The COM), as you will get familiar with other active Tweeters. You may also have people at or away from the meeting thank you for your Tweeting, as Twitter is a great resource for people who come in late to a session, are at a different concurrent session, or who are unable to attend the meeting. Accurately and carefully Tweeting events helps attendees take better advantage of the conference while they are there, have access to that knowledge after the meeting is over, and enhance the “Conference Effect” by extending the conversation beyond the physical meeting place and sometimes after the meeting is finished. Before moving on to “How,” we must address the “Can.” If you do not have a Twitter account, you cannot Tweet. Setting up a Twitter account is easy; simply go to Twitter.com and “Sign Up.” But before you do, read this post, “Is your Professional Portrait a Picasso or a Da Vinci?,“ on factors critical to setting up and managing your “Digital Identity.” Choose your Twitter “Handle” carefully as it will be identified with you here on out. One option is to use your name as I did (@HuotBethany), as this helps maintain a “consistent” Professional Portrait and increases your visibility in search results when people look you up. Quick basics before getting to the “Conference” specific etiquette. Unless your career goal is to be a stand-up comedian, keep it professional! It is best to restrict your escapades to the physical world and far away from the digital one. However, professional does not mean entirely impersonal. While you don’t want to fill your Twitter “Feed” with the daily exploits of your gerbil, an occasional shout out to your furry friend is OK. Congratulating a friend or wishing a family member a happy birthday is also appropriate given a little professional restraint. All in all, just remember the “Why” that motivates you to use Twitter in the first place. When Tweeting from a conference, always remember that people have put a lot of time and effort into researching and producing the information being presented. Be sensitive to whether or not the information they are sharing has been published and use restraint. Always respect when a speaker asks you not to disseminate their information outside the conference. Once you have determined it is OK to share the experience with the world, then by all means Tweet away! Once you are sure your Tweet is good & accurate (perhaps run it by a colleague to confirm), and you have maximized the use of your 140 characters, hit “Tweet” to submit. To continue your chain, you can “Thread” your Tweets using the “Reply” symbol on your published Tweet to link it with your next Tweet. 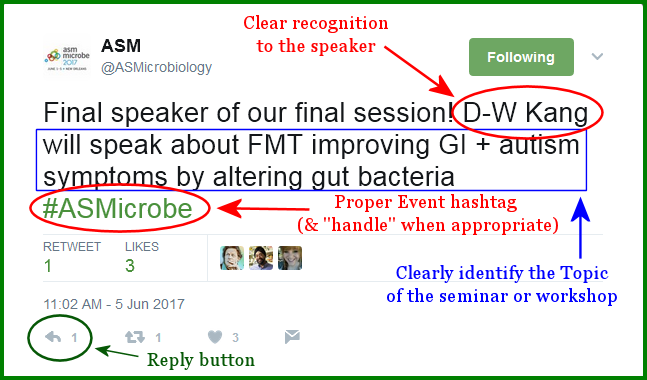 When continuing a thread, it is acceptable and even desirable considering your 140 character limitation, to abbreviate the speaker’s name i.e. : Kang. As with the original Tweet, always include the proper event hashtags, i.e. : #ASMicrobe and handles i.e. : @huotbethany. Tweeting is the perfect opportunity to practice pulling out the “Big Idea” in a talk, session or even themes from the entire conference. Remember to always use quotation marks to distinguish a direct quote from the speaker from your representation of their statement. 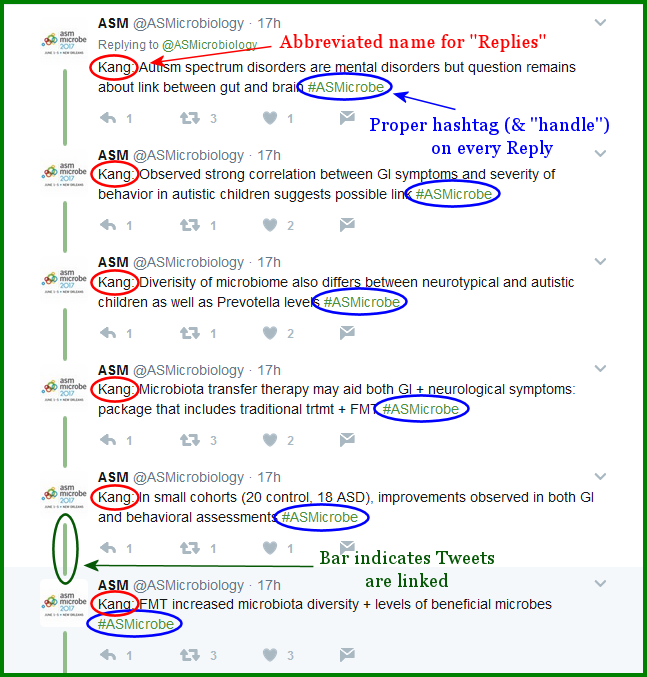 Note the green bar between Tweets; this indicates these Tweets are linked and part of a thread. These hashtags can be used by colleagues back home to follow the conference more easily by searching the hashtag in Twitter’s search box. This search will show all (and only) Tweets containing that specific hashtag. This process can also be used to more easily turn your conference experience into a “Storify” (Topic for another post). On that note, pay attention to hashtags and handles contained in Tweets you find interesting as this will make it easier to use their Twitter efforts to keep up or catch up. Well that’s it! Start Strategically Managing for your conference experience now. Develop a plan for who you want to see, what you want to learn, and how you can benefit the most from your time. Finally, consider how you can give back to the “Community of Minds” you are benefiting from, how you can share the “Conference Effect” back home with your local COM and with the Greater Global COM. Consider taking the time to Tweet! 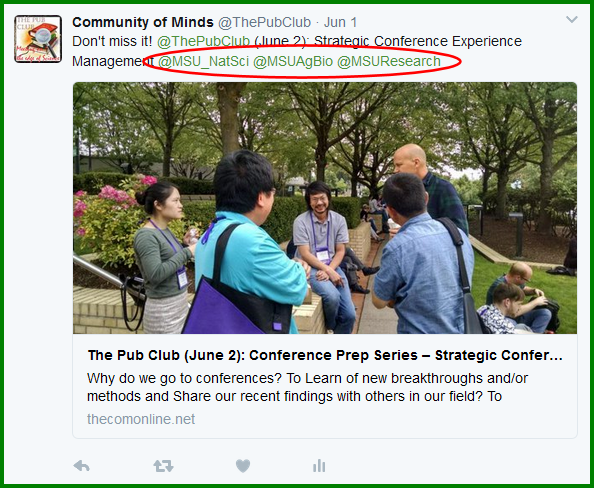 For more examples of Conference Tweeting, feel free to check out some of my conference experiences I have shared using Storify (click here to read).